Pampering sessions need not be two-hour affairs soaking in a hot tub (although that is my idea of heaven on earth!) - instead you can feel relaxed and re-engergised in just 20 minutes with the right products. If your hair and scalp is like mine and reacts to the change of weather and / or stressful times, a re-balancing shampoo can do it a world of good. 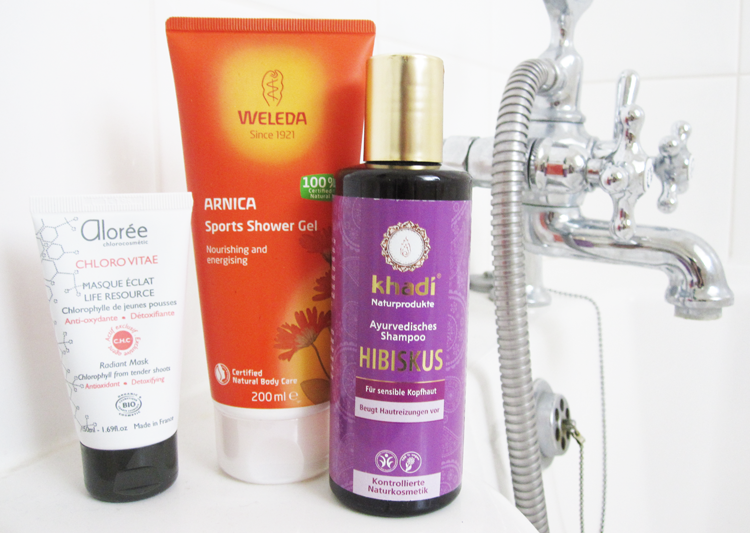 I've seen Khadi mentioned quite a lot recently on various green beauty blogs so I was keen to try them out for myself. Their Hibiscus shampoo helps to reduce scalp inflammation, balance sebum production and it also softens and gently conditions hair too. It has a pleasant but very herbally Lavender scent which I find relaxing and it's free from sulfates, alcohol, silicones, mineral oils, artificial fragrance and colours. The formula is primarily a herbal infusion in a mild coconut cleanser base and it does an excellent job at cleaning my hair and re-balancing my scalp when it's feeling irritated. I'd recommend double washing with this and only using a small amount each time. It's a bit of a trial and error getting the amount right as too much can make your hair look greasy and too little can leave it too dry, so play around with it - the results are worth it! Released last month, this is one of Weleda's newest products and the first time they have created a shower gel. I was given this in my goody bag from the Weleda Insight Day that I attended back in June so I've managed to properly test this out over the past two months. It has a lovely uplifting scent thanks to essentials oils such as Lavender and Rosemary, and I always feel more 'alive' after I've used it - a good one to reach for when you need a pick me up or after a sweaty session at the gym. A quick fix, multi-tasking face mask is a must in my skincare stash and this one from french natural brand Aloree gets to work in just 10 minutes. It's 100% natural and 90% of those ingredients are certified organic. Packed full of Aloree's unique Chlorophyll Complex which is derived from young Barley Shoots that help to protect the skin against free radicals, and a regenerating complex of Sunflower Seed, Grape and Olive oils to give the skin a much-needed moisture boost. This face mask feels hydrating and purifying whilst leaving my complexion looking brighter and clearer. I imagine that this would be suitable for most skin types, including sensitive, as it's feels very gentle on but certainly packs a punch. What are your favourite quick pampering products? Thanks for the idea of re-balancing shampoo. Just like you my hair reacts to changes of weather / stress too! I might go out and search for a re-balancing shampoo in the next few days :) Thanks for the enlightenment!